The January issue of Seamwork is up and ready for you to read! The Neglected R.: Let rituals transform your year, by Jessica Yen. Behind the Seams: Explore the construction of a girdle from the 1950s. The Origins of Clothing Sizes: How we wound up with our current sizing system, by Katrina Robinson. Strong Sewing: Make athletic wear at home that will perform with your body, by Alyson Clair. Movement for Sewists: Increase strength and mobility with eight simple exercises, by Haley Glenn and Kelly Lippert. Building your Activewear Wardrobe: The thoughtful process behind creating a customized athletic wear wardrobe, by Melissa Fehr. Unbusted: Sewing eases the decision to get a mastectomy, by Nicki Taylor. 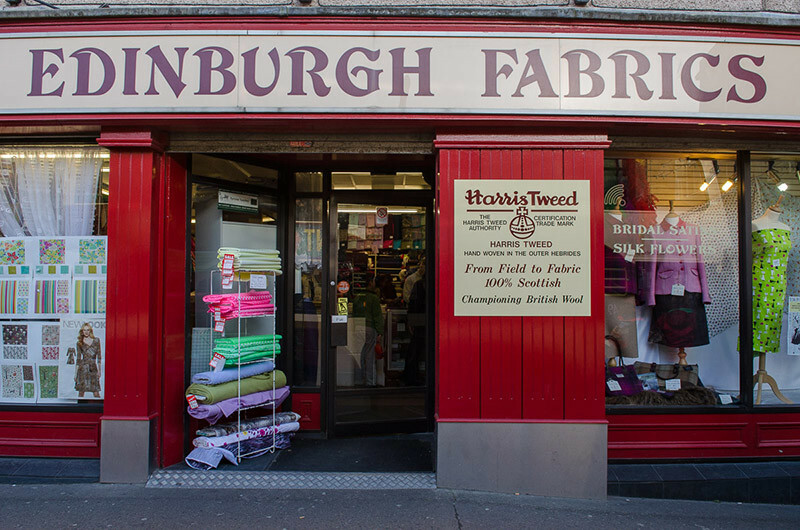 The Seamworker’s Guide to Edinburgh: Uncover inspiration, vintage finds, history, and a vibrant local designer scene in Scotland’s capital city, by Kristina J Seznec. Block Paper Scissors: Create a Rio tee with a unique overlapping back keyhole, by Devon Iott. Handmade Beauty: Relax with a Sweet Cream Soak Powder, by Kat Siddle. “Rituals can create pockets of time or space within our busy lives where we can enter into reflection, gratitude, focus on our intention to live consciously, and be present.” -Jessica Yen, The Neglected R.
With it’s subtle high-low hem and flattering relaxed fit, Rio is the perfect t-shirt. 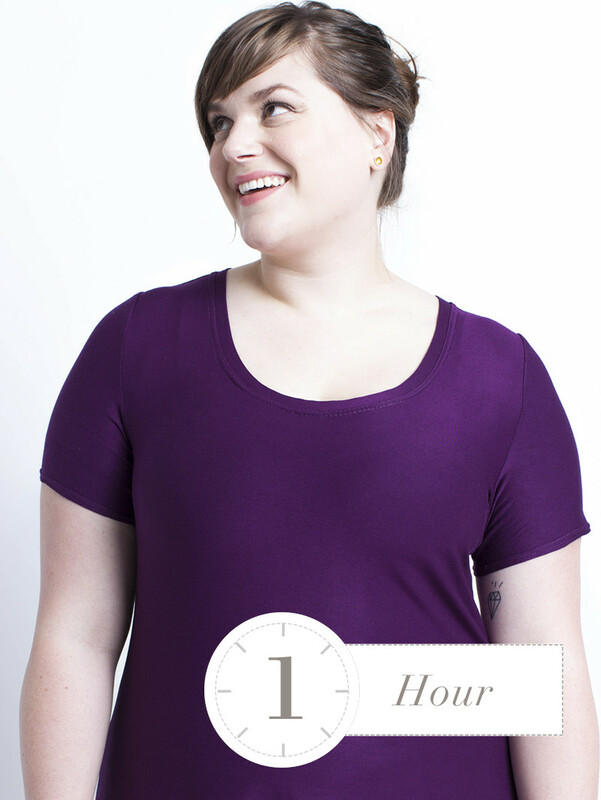 Rio features fitted short sleeves and a flattering scoop neck. The split hem adds interest while creating additional ease through the hips. This wardrobe workhorse sews up in just one hour and can be adapted for many occasions and activities. Aires will have you looking and feeling great even through the sweatiest work out. These fitted athletic tights feature curved style lines, perfect for color blocking. The crotch gusset adds strength and provides flattering fit through the rise. A wide waistband and moderate rise keeps Aires in place through downward-facing dog and burpees alike. Some thought-provoking content on the subjects of body shape and health; very appropriate for the New Year. “Unbusted” is particularly interesting. I won’t be making either of this month’s patterns. My preferred exercise is walking for transport and pleasure, largely *because* it does not require me to acquire or lug around stuff, and because it can be fitted around and between other normal daily activities. All I need are sensible shoes and street clothes that allow movement – one of many reasons why the Ginger skirt has become my wardrobe staple. But it’s good to see patterns for activewear being included in the Seamwork wardrobe lineup, and I am more than happy to use my credits on some of the older patterns. Something I would like to see Colette/ Seamworks address, or at least provide some resource links for, is adjusting patterns to suit very thin figures. Very young women in particular do not always fit a standard size. The author of “Unbusted” is another good example of someone without a conventionally womanly figure. Unbusted is without a doubt the best article. The purpose of sewing is dress ourselves with clothing perfectly fitted to our type of body, no matter how different we are. Unbusted was the best article, I would love to see some of her clothes. Sooo excited to make some yoga pants, yay!!!!! Wow, those look like some difficult seams to work with, especially the aires! Do you guys like the aires style of fitness pants? I’m more interested in good coverage than airing everything out. Most of the stuff I get is from Airabella Active so it’s cute solid colors without the crazy designs, but great coverage, and it’s nylon spandex so super soft, and stretchy.